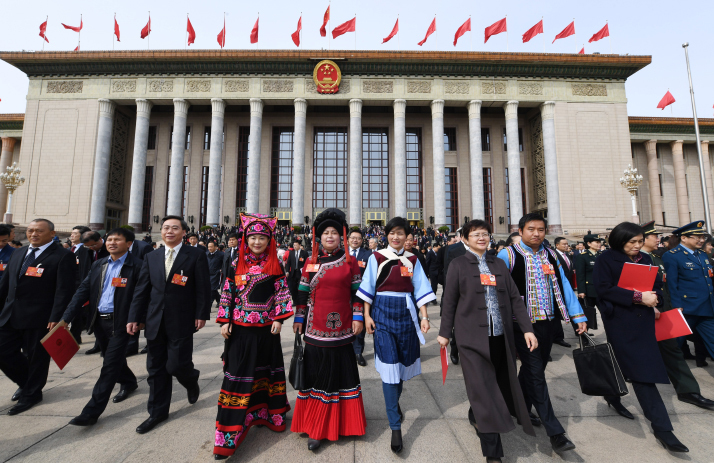 The First Session of the 13th National People's Congress (NPC), China's top legislature, came to a close in Beijing on March 20. 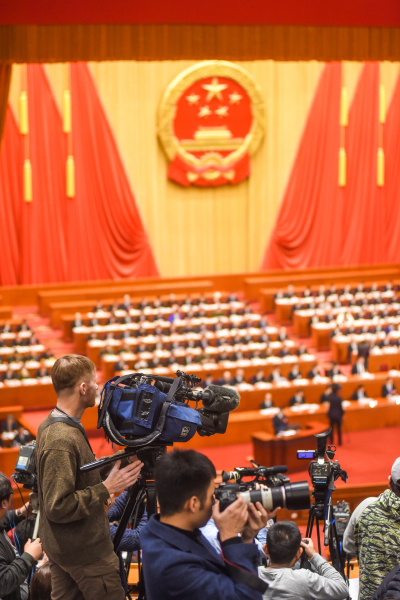 Over the two weeks of its duration, more than 2,900 NPC deputies elected and appointed state leaders, adopted an amendment to the Constitution and the Supervision Law, and endorsed a cabinet institutional restructuring plan, among other agenda items. Also, more than 2,100 national political advisors convened their annual session from March 3 to 15 and elected a new leadership of the 13th National Committee of the Chinese People's Political Consultative Conference. 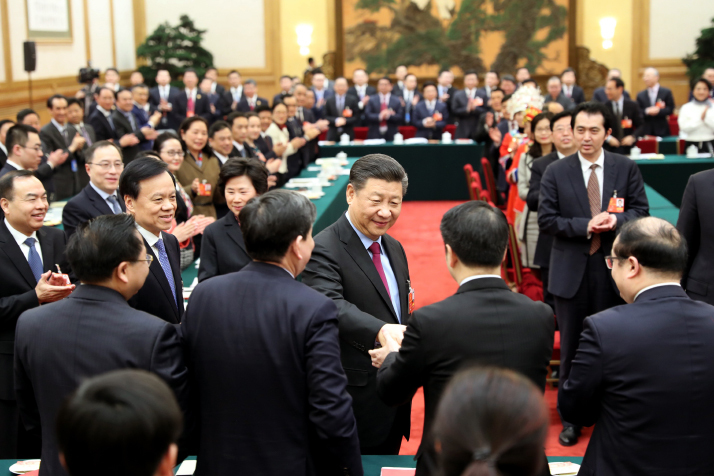 On March 17, Xi Jinping was reelected Chinese president and chairman of the Central Military Commission at the Fifth Plenary Meeting of the First Session of the 13th NPC in a unanimous vote. The Chinese people will continue to strive for the realization of the Chinese dream of national rejuvenation under the leadership of Xi. "It is a glorious mission and weighty responsibility to take on this great position of the president of the People's Republic of China. I will, as always, faithfully fulfill my responsibilities as empowered by the Constitution, be loyal to the motherland and the people, perform my duty scrupulously, do all my best, be diligent at work, and stay devoted and dedicated," Xi said in a speech at the closing meeting of the First Session of the 13th NPC on March 20. "I will continue to serve as a servant of the people, accept supervision by the people, and will absolutely not betray the great trust from all deputies and Chinese people of all ethnic groups," he added. In his speech after Xi's, Li Zhanshu, Chairman of the NPC Standing Committee, said it has been the collective will of nearly 3,000 NPC deputies and common wish of all Chinese people to unanimously elect Xi president of China and chairman of the Central Military Commission. "Comrade Xi is the core of the Party, commander of the army and leader of the people, who is supported by the whole Party, loved and respected by the people," he said. "He is the helmsman of the socialist nation with Chinese characteristics in a new era and the guide of the people." Since the 18th CPC National Congress in 2012, Xi, also General Secretary of the Communist Party of China (CPC) Central Committee, has been working to do away with the old and ring in the new, improve people's well-being, combat corruption and promote the new development of society. He has boosted targeted poverty reduction so that the whole Chinese nation can share the fruits of development. "To meet the people's desire for a happy life is our mission" were Xi's words which, alongside his unremitting effort, have deeply moved the people and made the country more united. Over the past five years, the CPC Central Committee with Xi at the core has launched a series of reforms based on wide-ranging studies of China's national conditions, resolving many longstanding problems and accomplishing many elusive goals, thus leading socialism with Chinese characteristics into a new era. Showing great foresight, Xi has led China to make historic successes in political, economic, social, diplomatic and national defense realms, epitomizing the conduct appropriate for the leader of a powerful country. In the new era there are still many challenges which China must face. Despite this, China has established the goals of finishing the building of a moderately prosperous society in all respects by the time the CPC marks its centenary and building itself into a great modern socialist country that is prosperous, strong, democratic, culturally advanced, harmonious and beautiful by the time the People's Republic of China celebrates its centenary. In order to achieve the Two Centenary Goals and the national rejuvenation, the Chinese nation must, under the guidance of Xi Jinping Thought on Socialism with Chinese Characteristics for a New Era and behind the strong leadership of the CPC Central Committee with Xi at the core, maintain concerted efforts to tackle tough issues and courageously forge ahead. China's new era is also an opportunity for world peace and development. China's destiny is closely connected with that of other countries through both good and bad times. Xi's proposal of building a community with a shared future for mankind is increasingly supported by the international community, and this idea is beginning to manifest itself in action. Xi will continue to lead the Chinese people to strengthen cooperation with the international community to promote common prosperity. Xi's vision for a community with a shared future for mankind is an open, inclusive, clean and beautiful world that enjoys lasting peace, universal security and common prosperity. All countries should respect each other, enter into discussion as equals, reject the Cold War mentality of competition and power politics, and approach state-to-state relations through communication rather than confrontation and partnership instead of alliance. The Belt and Road Initiative, first proposed by Xi in 2013, is tangible evidence that China is committed to building this community with a shared future for mankind. The Belt and Road Initiative, consisting of the Silk Road Economic Belt and the 21st-Century Maritime Silk Road, aims to build a trade and infrastructure network connecting Asia with Europe and Africa along and beyond the ancient Silk Road trade routes. It has already become a model for cooperation within the international community with the participation of more than 60 countries and regions. Under the leadership of Xi, China has transformed itself from a mere supplier of material products into a provider of international public products as well, contributing the ancient wealth of Chinese wisdom to the world. In the future, China will provide more positive perceptions, ideas and experience to global governance for the greater development of human society. The adoption of an institutional restructuring plan of the State Council, China's cabinet, at this year's NPC session marked the launch of China's biggest government reshuffle in years. But it is just part of a revolutionary reform of CPC and state institutions. According to a plan unveiled on March 21, the reform will involve the people's congresses, governments, political advisory bodies, as well as supervisory, judicial and prosecutorial organs. People's organizations, enterprises, public institutions and social organizations will also be covered. Initiated by the CPC Central Committee, the reform demonstrates the Party's intention to promote the modernization of the system and capacity for governance of the state. The public's aspirations for a better life necessitate the optimization of the structure and functions of Party and state institutions in education, culture, employment, healthcare and social security, so as to ensure people's access to child care, education, employment, medical services, elderly care, housing and social assistance. Their demands for democracy, the rule of law, justice, security and a better environment require the consolidation of the functions of Party and state institutions to improve democracy, the rule of law, market supervision, social governance and ecological protection in order to make legislation more sound, law enforcement more strict, judicial justice more fair, supervision more powerful and governance more effective. "Optimized, coordinated and efficient" is a phrase that concisely encapsulates the principles underpinning successive instances of institutional restructuring since reform and opening up began 40 years ago. After identifying the outstanding problems in the structure and functions of Party and state institutions, these principles form the blueprint for successfully affecting their reform. Optimization emphasizes a well-conceived structure of the Party and state institutions, and the more streamlined functions of these entities. The fundamental goal of deepening the reform of Party and state institutions in the new era is to uphold and strengthen Party leadership. In accordance with this prerequisite, it is necessary to ensure the reasonable allocation of duties and the augmentation of cohesive power to prevent the overlap of organizations and the duplication of roles and work. Government functions in economic management, market regulation, social governance, public services and ecological protection should also be strengthened and improved. Since the transfer of functions is closely connected with the reorganization of institutions, attention must be paid to the coordinated progression of reform and the strengthening of cooperation, while optimizing the structure and functions of Party and state institutions, so that those at all levels cooperate with and complement one another, and so that the overall system is both coordinated and highly efficient. These changes are aimed to adapt to the increasingly multi-faceted demands of the Chinese people in the new era. "It is a country where all power of the state belongs to the people. We must base our efforts on the interests of the people, ensure the principal status of the people, humbly learn from the people, and heed their needs and draw on their wisdom," Xi said at the closing meeting of the NPC annual session.